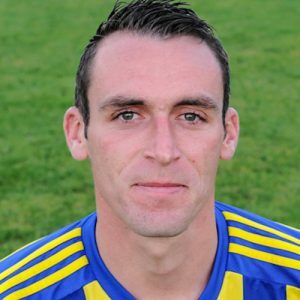 This weekend, Sporting Khalsa legend Craig Bannister officially announced his retirement from playing Saturday football. Over the best part of four seasons with the club, Banner became the club’s leading goal scorer and was the architect of some astonishing memories (see below). Everybody associated with Sporting Khalsa would like to thank Banner for everything he has done for Khalsa and the part he has played in the club’s recent success. In addition to helping Khalsa to the West Midland Regional League title, the JW Hunt Cup and the Walsall Senior Cup, Banner was a key player in the club’s FA Cup run in 2015 and the FA Vase run in 2016-17. Most impressively, Banner was the top-scorer in the whole FA Cup competition in the 2015-16 season with nine. Khalsa boss Ian Rowe said: “It’s difficult to sum up just how important Banner has been over the last few seasons. “Not only has he scored a bagful of goals as he has throughout his career, he’s often been asked to play deeper when I’ve needed him to and been brilliant there too. “His attitude is always first-class and he’s not complained once when he’s been subbed off after 70 minutes. Your author has picked six of his favourite Banner moments, and he’s enjoyed a LOT of them down the years! Ian Rowe made the tactical masterstroke of letting Wulfs take a two-goal lead before bringing Banner off the bench. Banner immediately notched a hat-trick to give Khalsa a famous victory. A frantic, closely fought affair is won when Banner picks up the ball 30 yards out, turns a couple of defenders and chips the keeper for one out of the top drawer. Banner is on absolutely breath-taking form, smashing a predatory hat-trick (the second was the best of the bunch in your author’s humble opinion) to earn in the final at Marston Road. He loves a long-range dipper, this lad. This one from just outside the penalty area into the top left-hand corner was amongst the best to come from these cultured boots on a memorable day for the club. Facing the team which had won Khalsa’s league at a canter the following season, Ian Rowe’s men were the underdogs. But nobody had counted on Banner who bagged two goals, including a late headed winner. You author’s personal favourite. With Khalsa four up and coasting, substitute Banner found the ball in front of him on the break, held the ball up, quick glance up at the keeper and an inch perfect Cantona-esque chip into the far corner. It might not have been the most important, but for sheer brilliance it took some beating.